Time Attack Team took a hard fought second place at Autoclub Speedway. Back 2 Back The Mint 400 overall winners. Lucas Oil Arizona Regional Series, kicked off at the Wild Horse Pass Raceway, in Chandler AZ. to get the new competition car ready. if exposed to light for too long it loses its effect. Valerie Thompson races one of America's fastest BMW S 1000 RR land speed motorcycles. Brad Nauditt 25 years old and from Spokane, Washington - Motorcross. Kelsey Rowling the "Drift Chick"
New update, photos and video from our long time associate Pat Fitzsimons and his 1963 Elva. Triple Nickle Racing and their Baja-style race car, 1964 Ford Galaxie. Follow us on instagram, our user name is "torcoracefuels" click here« to go to the page. 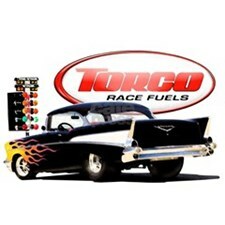 Check out our new Torco gear, More designs to come!